Save some money with my special offers and discounted psychic readings! Here are the current discounts, specials and freebies. Buy a love astrology compatibility report (for those who want to know if they are compatible with someone, or for those in relationships to find out more about each other) and get a £5 discount off any email reading. 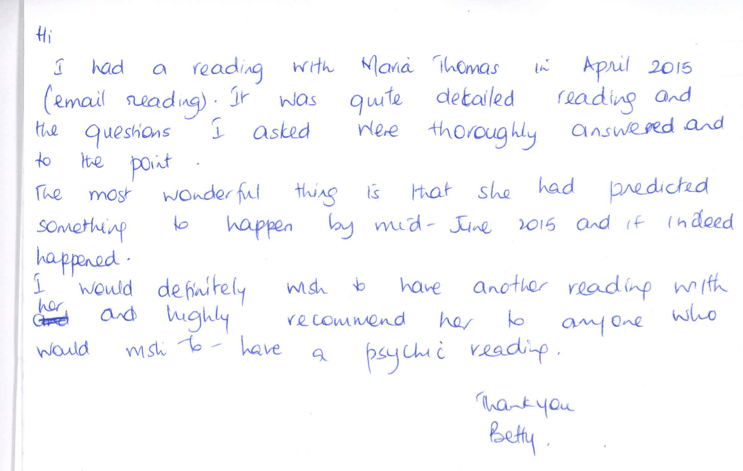 Send us a video testimonial and get your next psychic reading completely free! 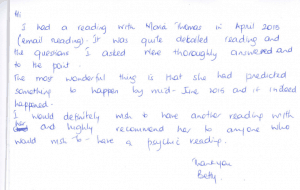 Write a handwritten testimonial about a reading you’ve had and email a copy of it to me to get £10 off a future reading. Please see one of our glowing handwritten reviews below! Love special offers on clairvoyant readings? Receive my occasional newsletter to find out about future special deals and discounts, life affirming articles by me and to be automatically entered into a monthly competition to win personalised astrological reports and free psychic phone and email readings! AND/OR Like us on Facebook to get free readings, extra competitions and beautiful and inspiring pics and messages – I will be periodically giving away free tarot readings by myself on here, only for facebook users!